Making your own Christmas cards is a great way to show someone how much you care. Adding a fun, pop-up surprise inside increases the wow factor your homemade card is sure to inspire. Make one or all of these pop-up Christmas cards and surprise someone for the holidays. This card, pictured above, features a pop-up snowflake when you open it. The snowflake remains up even when the card is open fully, so it can be displayed. 1. 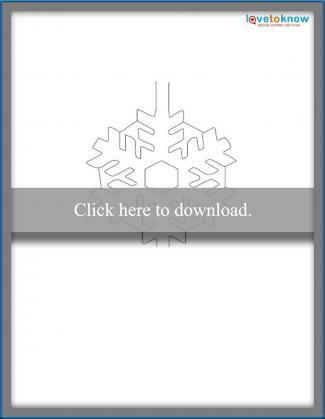 Download the snowflake printable below and print it out on a sheet of white cardstock. If you need help downloading the printable, check out these helpful tips. Download this template to make the card. 2. Fold the cardstock in half so the snowflake is on the interior of the card. 3. Cut along all black lines of the snowflake using scissors or an X-Acto knife. 4. Gently put your finger behind the long tab at the top of the snowflake and pull it forward. Bend and fold the top tab to pull the snowflake out. 5. Bend the front of the tab so the snowflake remains facing you. Bend the bottom of the snowflake so it pushes out at the end. 6. Glue the sheet of blue cardstock to the outside of the white cardstock, giving a blue background to the snowflake image inside. 7. Write, paint or stamp the words "Merry Christmas" to the outside of the blue cardstock. 8. Glue some plastic snow crystals onto the front of the card. This secular Christmas card features three "cold wind" pop-ups on the inside. 1. Cut along the curling lines of the Citronella waves paper to make three different abstract shapes showing the waves. Set them aside. 2. Fold the sheet of blue cardstock in half and lay it folded in front of you with the folded edge toward you. 3. Make two parallel cuts 1/2-inch apart and 1-inch long approximately 1-inch in from the right side of the card. Make two more cuts in the center of the card, and a final two cuts 1-inch from the left side of the card. Make parallel cuts 1/2-inch apart on the folded edge. 4. Open up the card and push the cut pieces in so they fold the opposite way from the rest of the card. 5. Glue one of the abstract shapes to the front edge of each of the cut pieces. Shut the card to flatten the pieces along with the pop ups. Glue shapes to the pushed-in cuts. 6. Cut a 2-inch thick strip of Citronella waves paper and glue it to the outside, top front of the card. This will cover the cut areas that are tucked inside the card. 7. Write or stamp on the outside of the card, "Sending You Warm Thoughts This Christmas." 8. Write or stamp on the inside of the card, "When the Wind Blows Cold." This is a very simple card that children can make as well. A small Christmas tree pops up inside. 1. Cut out a small tree shape from a piece of adhesive-backed green cardstock. The tree should be slightly asymmetrical and whimsical in shape, measuring about 4-inches high and 2-inches wide. 2. Punch out several circles from a piece of red, adhesive-backed cardstock and stick the circles onto the tree as ornaments. Set the tree aside. 3. Fold the sheet of glitter cardstock in half, glitter side out. 4. Set the card down with the folded edge facing you. 5. Make two parallel cuts into the folded edge 1-1/2 inches apart in the center of the card. 6. Open the card and push the cut piece in so it folds the opposite way of the rest of the card. 7. Fold the card closed and set it aside. 8. Stack four pieces of yellow adhesive-backed cardstock on top of one another and draw a slightly asymmetrical four-pointed star on the top sheet. Cut the star out of all four sheets at once. 9. Separate the four stars into stacks of two and two. 10. Rotate the two stacked stars so you have two, layered eight-pointed stars. Arrange stars on top of one another. 11. Remove the adhesive backing from the top star and stick them together. Glue star to cover the square notch. 12. Remove the adhesive backing from the bottom stars and glue one to the top, front of the card covering the square notch where the paper folds in. Glue the second star to the top of the Christmas tree. Glue the tree to the front of the notch. 13. Cut strips of yellow adhesive cardstock and peel of their backs. Stick the strips in a sunburst pattern in back of the tree on the interior of the card and around the star on the exterior of the card. 14. 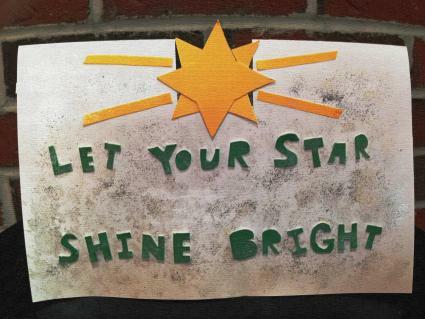 Apply adhesive letters or rubber stamp the words, "Let Your Star Shine Bright" onto the outside of the card. On the interior of the card, apply adhesive letter or stamp the words, "This Christmas". Pop-up cards can be as simple or as complex as you desire. Follow these steps to create some fun cards, and let them be the inspiration for dozens of other card ideas you may have.